As a Christmas gift one year I received a distressed copper colander. My father thought my mother crazy for purchasing the worn piece of metal but my mother knew I would like it, and like it I did. 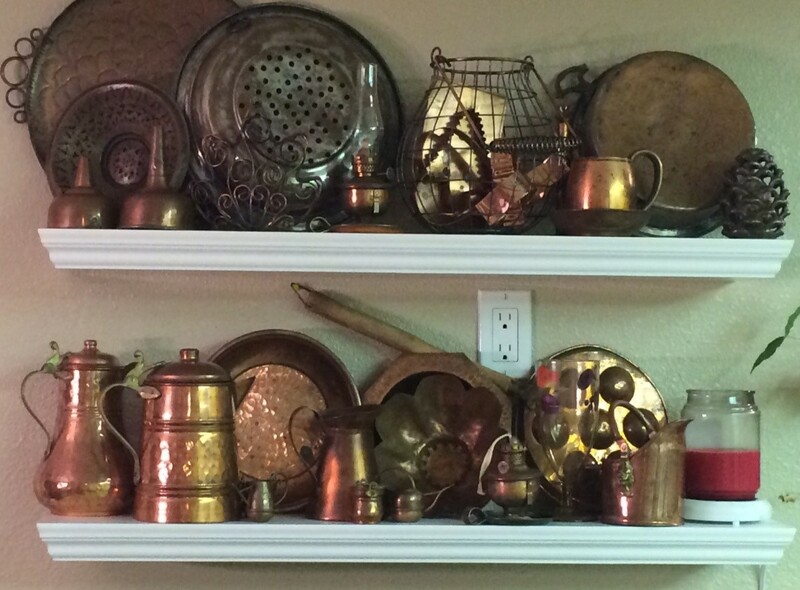 For over 20 years since, I have collected unique copper kitchen pieces. I’ve rummaged through second hand and antique shops keeping an eye out for the next piece. My Mother-in-law joined my mother in the copper gift giving tradition and they have contributed some great pieces to my copper collection! Some of my pieces are new and shiny while others are not. Some of my favorites once belonged to family members, like my small oil hurricane lamps and a funnel. A small pitcher was handcrafted by my father-in-law. I like having them on display in my kitchen but as with most things, keeping a collection under control and not just adding to the clutter can be tough. To declutter my kitchen I have found the following solution to work very well. Grouping! For all of those things that want a home in your kitchen but make it feel cluttered, or simply can’t find a spot — try this: Group like items together in collections. Whether you have a few items or many, this solution looks great while letting you have an organized kitchen. Grouping collections in a display looks purposeful, and therefore less cluttered. Think you don’t have any collections? Think again! Do you own several pieces of Pyrex, or a large quantity of coffee mugs? Maybe you have an abundance of cookbooks, like I do. Just follow these easy steps-your decluttered kitchen is just a collection or 2 away! Gather up those things you love and want to see and enjoy in your kitchen into one place. Group them in some way — color, type of item, etc. These are your collections. Decide where and how to display them. I recommend going vertical so that you do not fill up valuable workspace on your counters. A simple set of wall-mounted shelves works well for displaying collections. As you can see, by putting larger items in the back and smaller items in the front I can see everything in my collection and get more on the shelf. Including the 6 cookie cutters in the basket there are 31 items in this collection on just 2 shelves. It looks great and uncluttered. 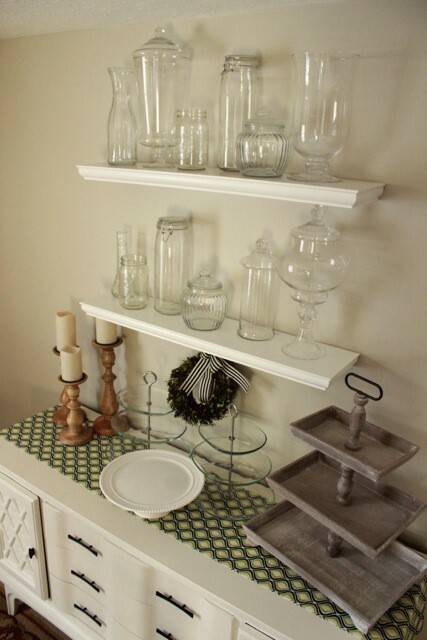 I really like these clear glass jars and vases my daughter has displayed in her dining area. In an effort to declutter her kitchen, she pulled the once random pieces out of cupboards and corners and grouped them together. It is fine to mix in a few pieces that do not exactly fit the collection as my daughter did. In this case, doing so added a little variety and needed color. Another way grouping works is to group items you use every day by color. These can be kept on a shelf or in an open cupboard while other mis-matchy things are kept behind cupboard doors. See — you’re realizing you do have some collections, aren’t you? I bet you’re thinking rolling pins are a strange thing to collect — well that may be, yet I have them. I love things in my kitchen with history. If these rolling pins could speak (Which I know they can’t — not that crazy! Just crazy enough to collect used rolling pins) imagine the stories they could tell about the women who used them and the families to which they belonged! (This makes me a little weird, huh?) Anyway — since I have them, and love them, and want to keep them I had to find a place for them when decluttering my kitchen. 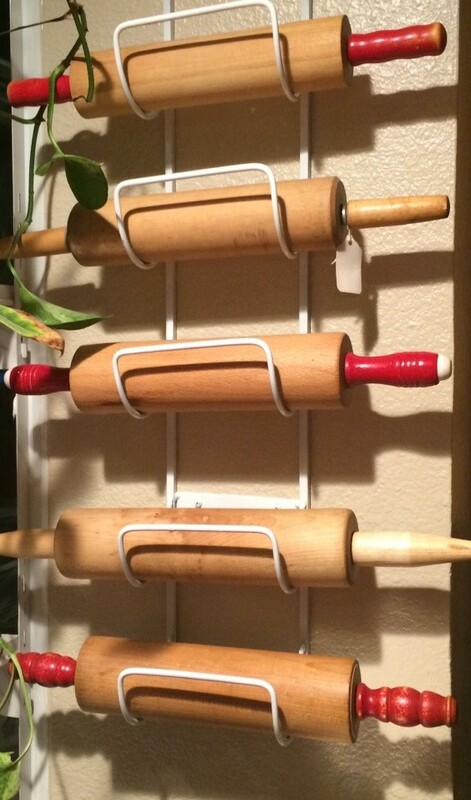 A simple wine rack is perfect for displaying my collection of rolling pins. They come larger than this, but I do not intend to acquire anymore so this one is the perfect size. I am a believer in surrounding yourself with those things that inspire you. One way to keep those things organized and adding charm to your home is to group them and display them in collections. Try it for yourself; we think you will like the results! We would love to see what you do in your kitchen. 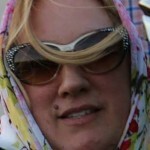 I hope you will share your pics! This is so great and looks wonderful. Awesome ideas! Why thank you JoAnn! I hope you’ll try it in your kitchen!